Are you an aspiring author who would like to know how to publish a book? Well you have come to the right place. Whether it's a paperback or e-book - this is the only audiobook you will need to make your dream of writing a book come true. Writing a good book, compared to a bad one, involves one thing: work! No matter how you approach it, a great deal of time and commitment is required. Nevertheless, seeing a book through to completion need not be a grueling task. If you approach the process with a thought-out plan, it can actually be enjoyable. There are many reasons that people would like to write a book - what's yours? Defining why you would like to write a book is important on several levels. First, it helps you figure out how dedicated you will be to completing your writing project. Your writing project can be a "short-term" or a "long-term" project. Many aspiring authors have started writing a book but were side-tracked because of unethical people who have led them down the wrong path in the publishing industry. This audiobook will help you get back on track and make your dream of writing a book come true. This audiobook contains all the ins and outs of the writing and publishing industry. It was written for anyone who needs to know how the book industry works; Fiction and Nonfiction writers with a book concept who need to know next steps; Writers with finished novel manuscripts who are starting to consider submitting to editors and agents; Writers who are currently submitting their work and not getting the responses they expected or hoped for; and previously published authors who have been out of the game and need a refresher for the digital era. Writing, as opposed to publishing, requires almost no financial or physical resources. Whether you're allowing a traditional publisher to produce your book, or you're striking out on your own to self-publish, becoming an author can be a rewarding experience if you allow it to be. Authors pronunciation was atrocious. Great information very helpful but I think if the author took a diction class which would help her pronounce words correctly then she would be a better narrator. I loved this book because it was informative, I have down a lot of research on listing snooks; therefore, I knew a little about some of the things that she mentioned, I know a lot more now. I would recommend this book to anyone interested in writing this book. I loved it, I am ready to move to the next level with my writing. This book has equipped me with necessary knowledge. I bought this audiobook as I think I've got a book idea but don't know where to start, so was basically looking for tips. Well, I picked the wrong title. This book is full of cheap information that aren't meant to actually help anyone write a book but rather give an overview of the entire subject at best. At worst it's self-promoting material in some places. Some 'advice' are either obvious or bordeline ridiculous. This has to be one of the worst audiobooks I've listened to and it was hard to get to the end. 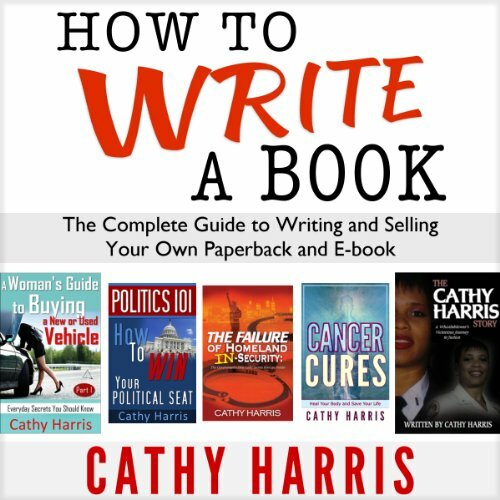 What could Cathy Harris have done to make this a more enjoyable book for you? Refrain from trying to cover so many topics and instead focus on just a few aspects of the book writing process but go deeper. Way deeper. LibRary pronounced "libary" a thousand times throughout the book. Disappointment, and anger for feeling ripped off. Cathy does a good job. The audio is clear and the performance was energetic. It held my interest all the way through.